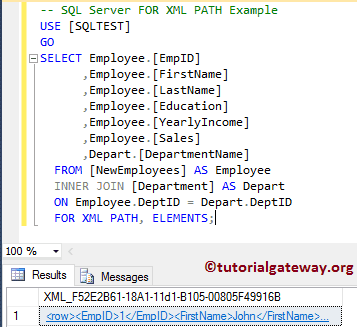 The Path mode with FOR XML in SQL Server returns result set as the XML element. 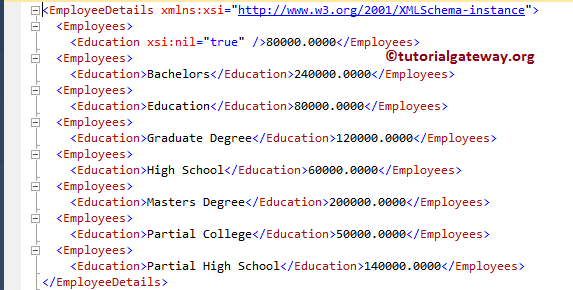 Unlike other XML modes, this mode provide control over the generated XML file. This is because, path mode treats column names, and alias names as the XPath expression. 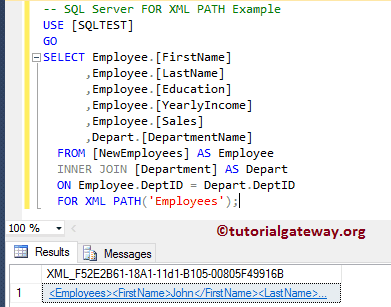 In this article we will show you list of examples that explains the use of SQL FOR XML PATH mode. 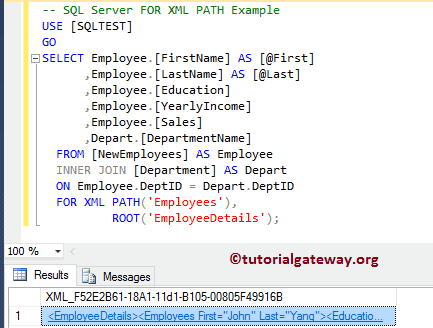 For this example, We are using the New Employees, Department tables present in the SQL Test Database. 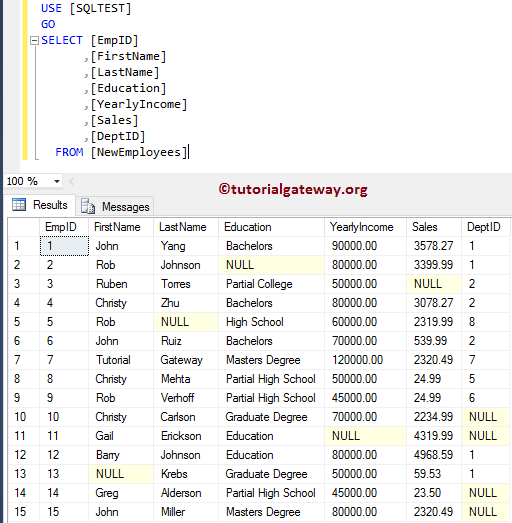 Below screenshot will show you the New Employees table data. 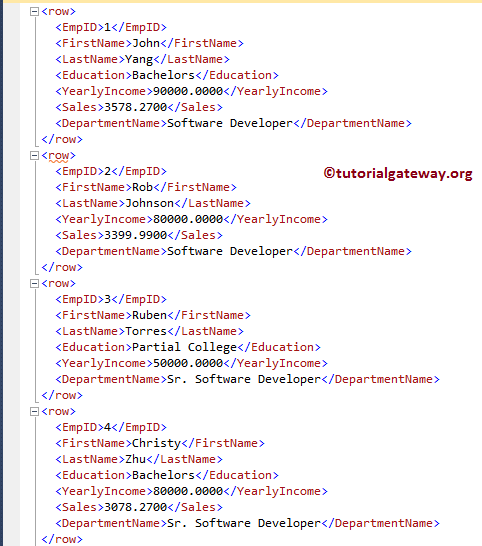 This example show you the basic way of using FOR XML PATH mode. 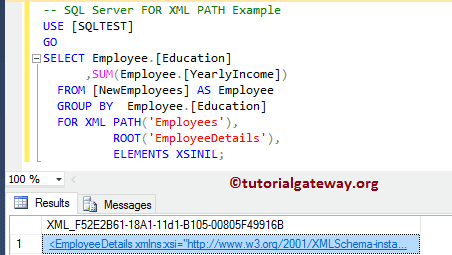 The simplest way of using path mode is to append FOR XML PATH after the Select Statement. 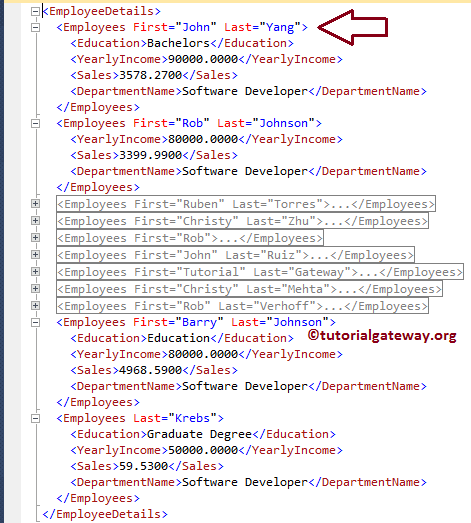 As you can see from the above screenshot, query has generated the XML file. Please click on the hyperlink to see the XML file. This is fine for the single table, let me try on multiple tables using the Joins. 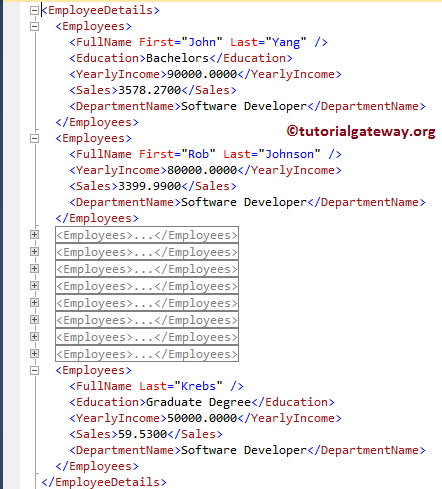 The SQL Server provides ELEMENTS keyword to display the column names as nested elements. 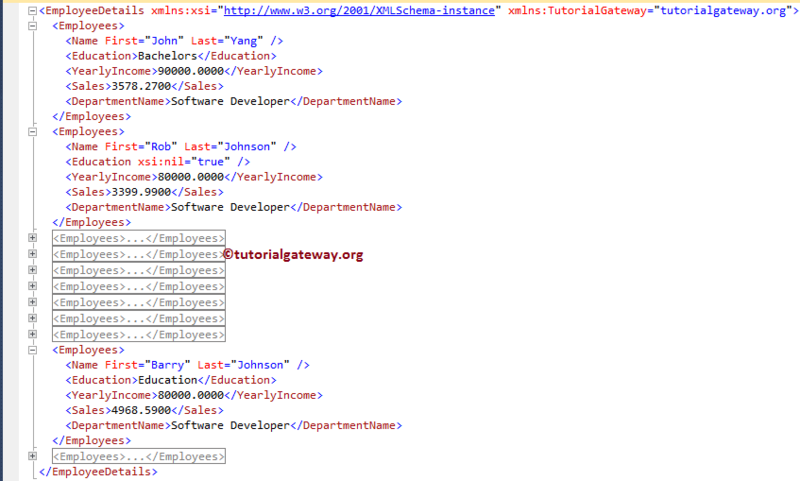 Let me use this keyword along with the FOR XML PATH. If you observe the above screenshot, every row is separated by the default <row> element. In this example we will show you, How to override the default row with custom element. 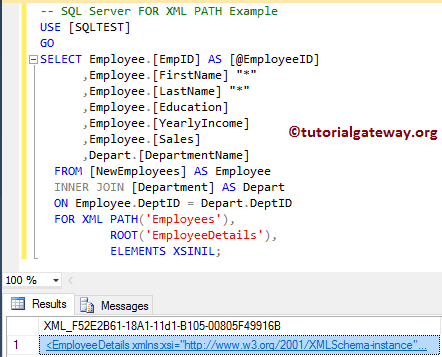 The Sql Server FOR XML PATH allows you to create a new root element that will wrap all the existing elements inside it. 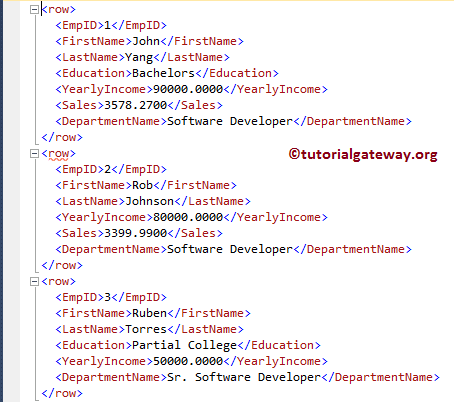 In order to achieve the same, we have to use the ROOT keyword along with the FOR XML PATH. 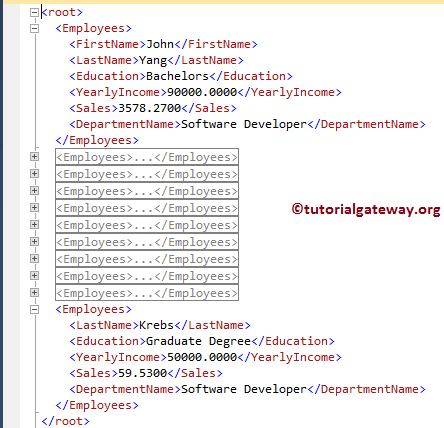 If you observe the above screenshot, there is a <root> element as the parent level. 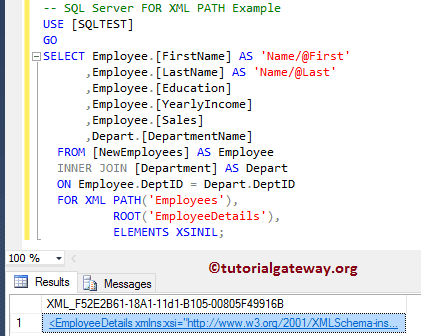 In this sql for xml path example we will change this default element name. 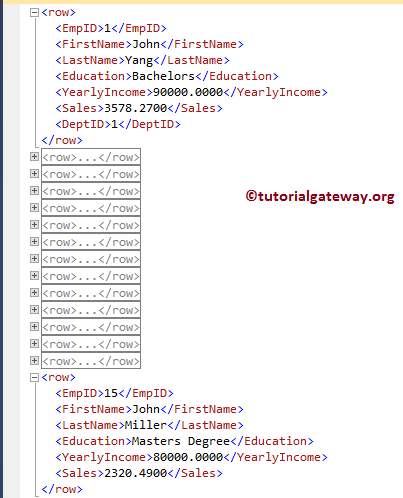 If a column name (or Alias name) starts with @ symbol, and does not contain the / symbol then that column will be added as an attribute to the row element. 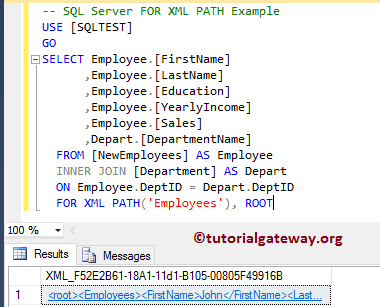 From the below Sql Server for xml path code snippet, First, and Last are starting with @. It means, both of them will be added as an attribute to the Employees row. 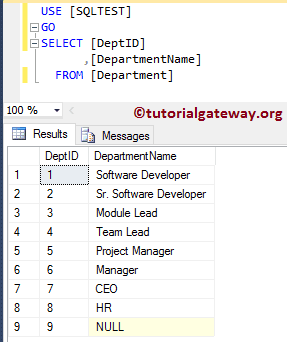 If a column name (or Alias name) does not starts with @ symbol, but contains the / symbol then that column name indicates hierarchy. 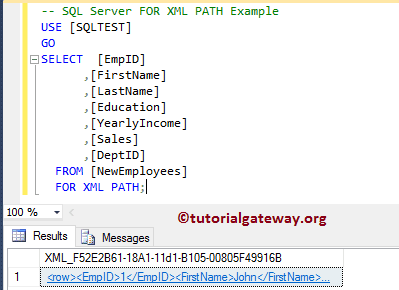 From the below sql for xml path code snippet, First, and Last are not starting with @, but it contains slash symbol. 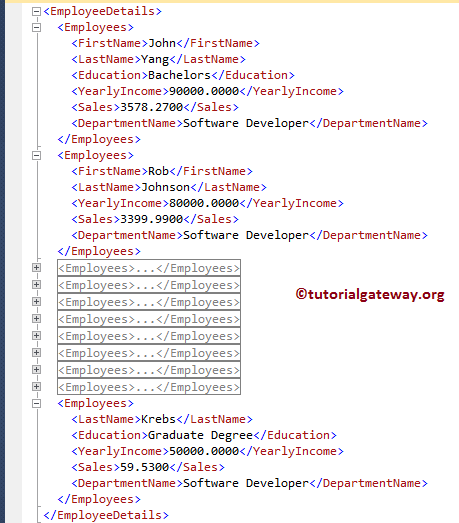 It means, new hierarchy called FullName will be created and both First, and Last will be added as an attribute to the FullName. 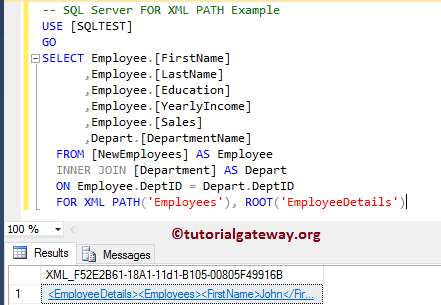 You can also use the Wildcards along with the Sql Server For XML PATH. 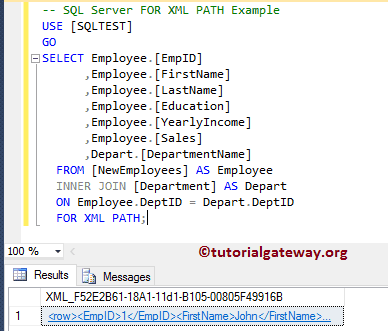 In this example ,we will show you, How the Sql Server XML Path handles the unnamed columns. 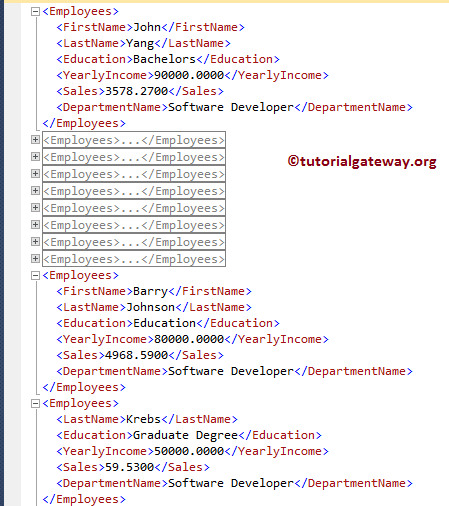 If you observe all the above examples, the generated XML file is ignoring the elements with NULL values. 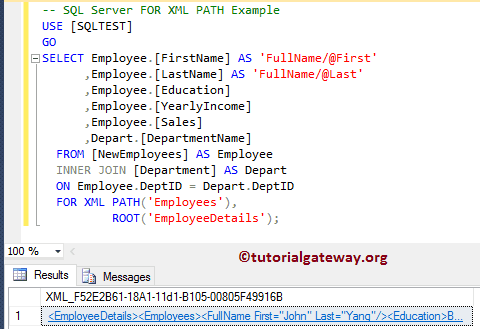 This is the default behaviour of the SQL For XML Path. 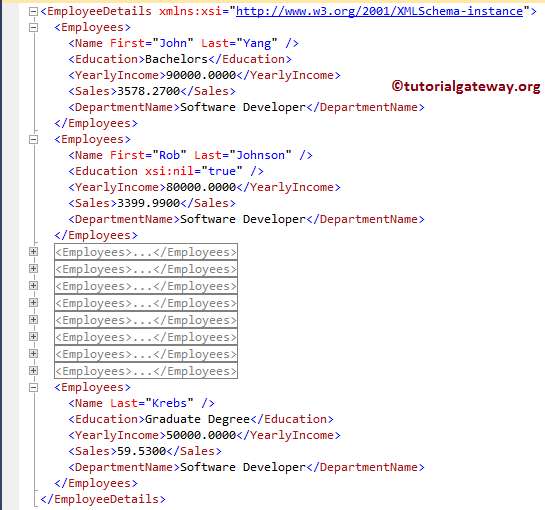 However, you can change this by adding ELEMENTS XSINIL keyword. 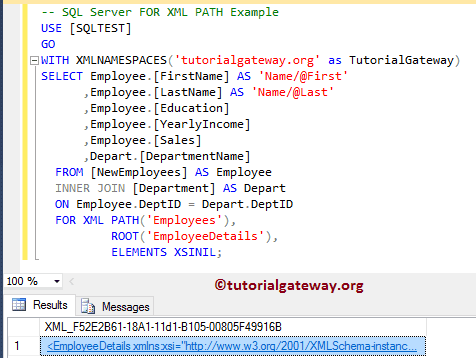 By using the XMLNAMESPACES keyword along with SQL For XML Path, you can assign your custom namespace to XML file. In this example, we will show the same.